Asthma is for real, my friends! Nearly a year ago, I let you all know that I was diagnosed with asthma. Since then, I have kept my asthma under control. Yes, I have had flare ups here and there, but with my trusty inhaler, I would knock those flare ups out of the park and my breathing would return to normal. Or my normal, anyway. To be completely honest, I am not even sure what normal is when it comes to my breathing. And I mean that. To me, I have always been a heavy/hard breather and breathing doesn’t come natural, as strange as that may sound. I have to work at. And that was even before I was diagnosed as an asthmatic. Like I said, since being diagnosed, my asthma seemed to be under control. Holy sch-nizzle, people, this breathing stuff has been hard work. REALLY hard work. So what happened on Saturday? To be honest, I am not real sure. The cold and damp weather, along with running six miles in that cold, damp weather may have been the culprit for my first big, holy-hell-can’t-get-this-under-control asthma attack. And I am going to tell you, it was kind of scary. Although, I will admit, I tried to play it cool. I don’t think that worked though, I think my hubby was just a wee-bit concerned as well. 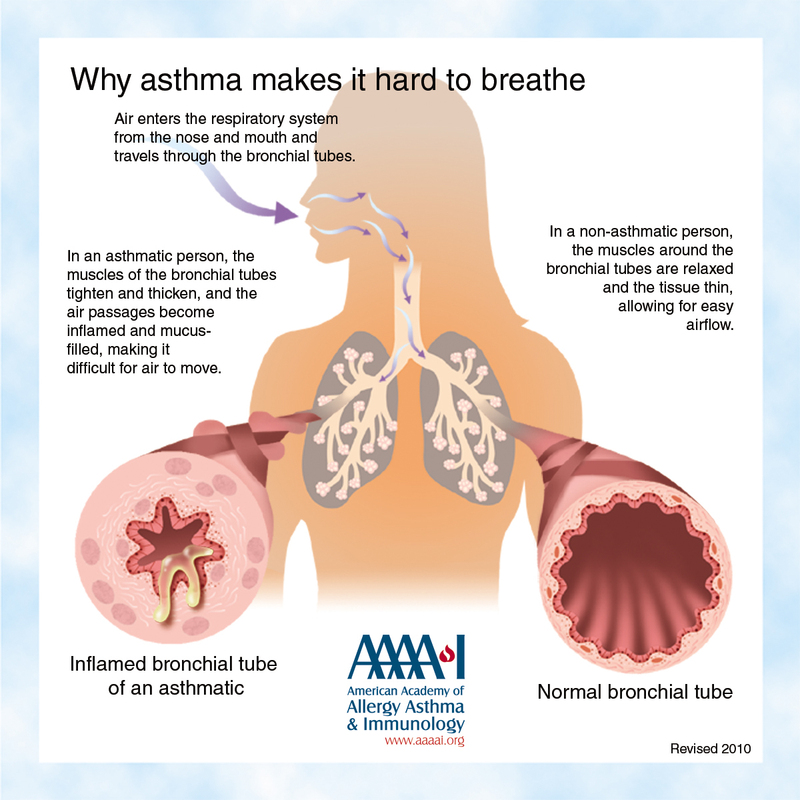 So, what really is asthma or what is an asthma attack? Well, I did some research on the good ol’ internet and found lots of information. Keep in mind, this is NOT the first time I have done research. I just haven’t done it in a long time. You see, my son was diagnosed with asthma when he was 18-months-old. And yes, it was probably caused by me being a smoker. Read THIS BLOG POST about my 10th anniversary of quitting. Anyway, back to asthma. You can read more about asthma from the American Lung Association HERE, you can view a really cool slide show about it on the WebMD website HERE or read more on that site HERE or from the asthma.com website HERE. According to WebMD, an asthma attack is a sudden worsening of asthma symptoms caused by the tightening of muscles around your airways (bronchospasm). During the attack, the lining of the airways also become swollen or inflamed and thicker mucus – more than normal – is produced. All of these factors – bronchospasm, inflammation and mucus production – cause symptoms of an asthma attack. About half-way through the night, I woke up having a really hard time breathing. And I thought my wheezing was going to wake up Al. I got up and used my inhaler and sat on the couch for a spell. I will admit I felt kind of panicky. Not an all-out panic attack but just slightly panicky. I ended up waking up my son – my awesomely wonderful terrific son, who obviously knows what asthma attacks are like. Usually when I wake him up – no matter the time of day or night – he gets a little cranky. (Sorry, Brandon, but you do!) This time, however, there was no crankiness at all. Just helpfulness. He was up and on it in no time flat. 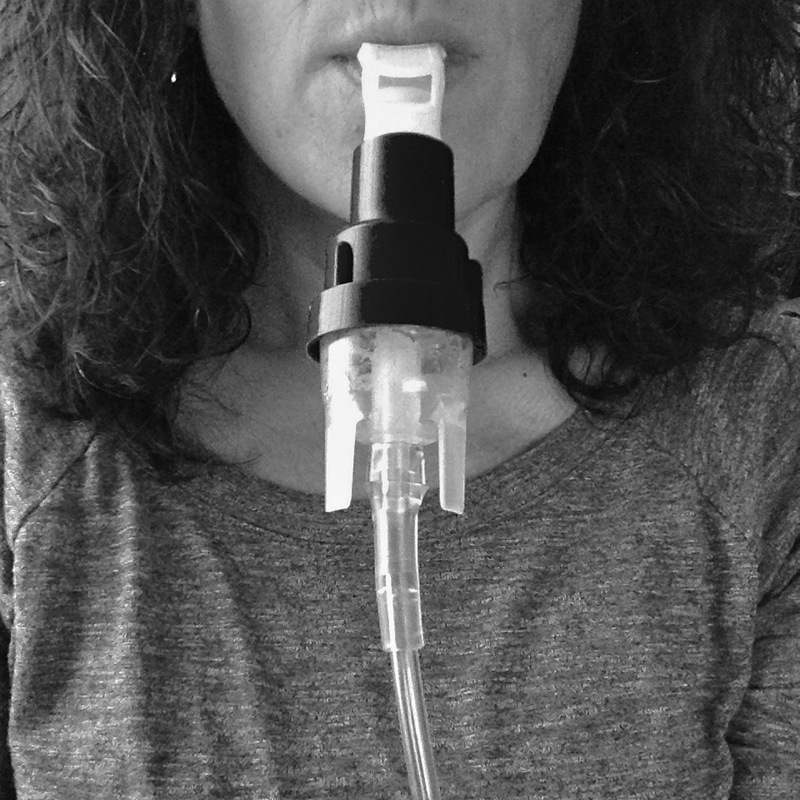 Before I knew it, the nebulizer was beside me on couch (I went back upstairs while he found his nebulizer and meds), medicine was being put in it and the mouthpiece was given to me and the machine was turned on. THANK YOU, Brandon, for not being crabby and for helping your mom out. Not sure what I would have done without you AND your nebulizer! I also have to tell you that I used my Young Living Essential Oils, which normally, have helped tremendously. I used my Breathe Again roll-on and also a roll-on that a consultant made up for me that is specific for asthma. This time, however, I didn’t think nothing but the nebulizer was going to work. At around 7:30 a.m. Sunday morning, after not a fun night, I decided to take a bath and hope the steam from the hot water, along with my Thieves and RC oils mixed with some Epsom salt bubble bath, would also help. Help more so to calm me down. The medicine used in the nebulizer tends to make me a wee-bit shaky. 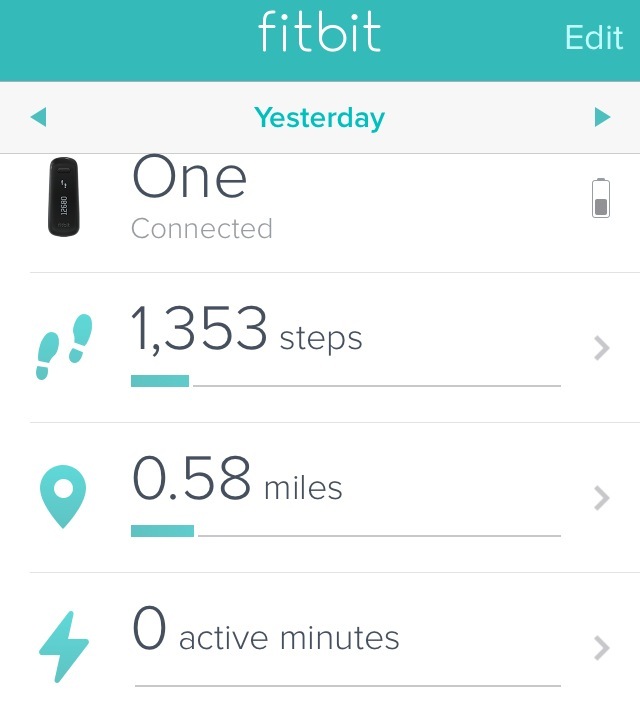 I spent much of Sunday on my couch, which is VERY evident when looking at the data from my FitBit. Didn’t even hit 2,000 steps! I used my inhaler and the nebulizer throughout the day. The nebulizer would help for about three to four hours. I could definitely tell when it was needed again. This morning, Monday, I decided that the neb treatments and the inhaler weren’t cutting it. I know what I needed and what would REALLY help. Yep, good ol’ prednisone. I hate taking the stuff because it makes me really jittery and stuff, but I also know that it is really the only thing that helps. I know it was/is the only thing that helped my son when he was having an asthma attack. Yep. 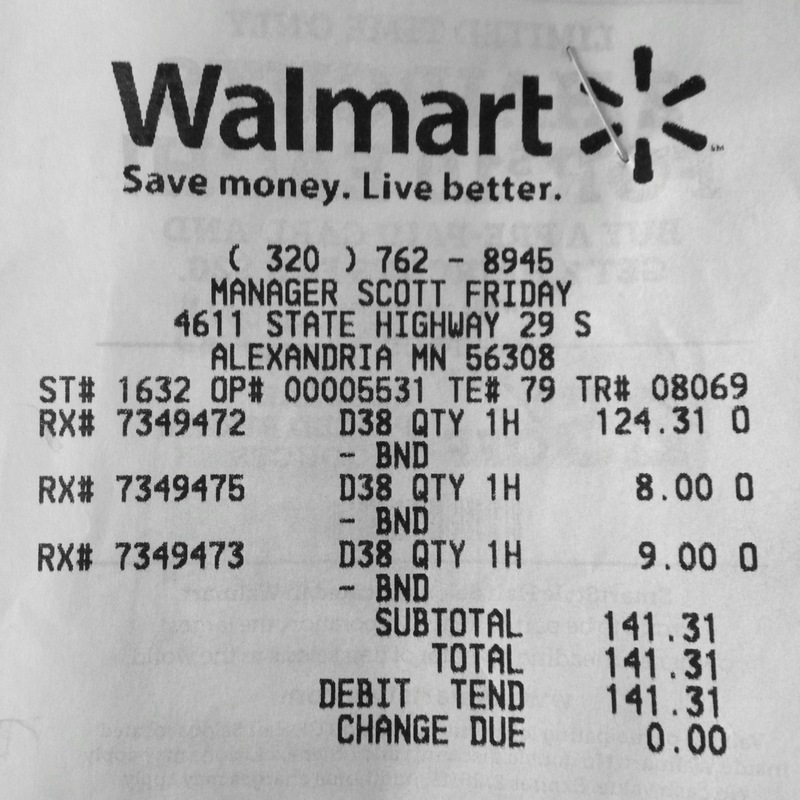 Three prescriptions and one hundred and forty one dollars and thirty one cents later, I was on my way home – broke, but ready to start breathing again! The $8 one was for the Prednisone. A five-day dose of it. Two tabs once a day. The $124.31 one, which by the way without insurance would have cost me $212.77, was for a new, daily inhaler, Pulmicort. So, there you have it. Asthma, my fine friends, is for real. I have it. I don’t like it, but I deal with it. 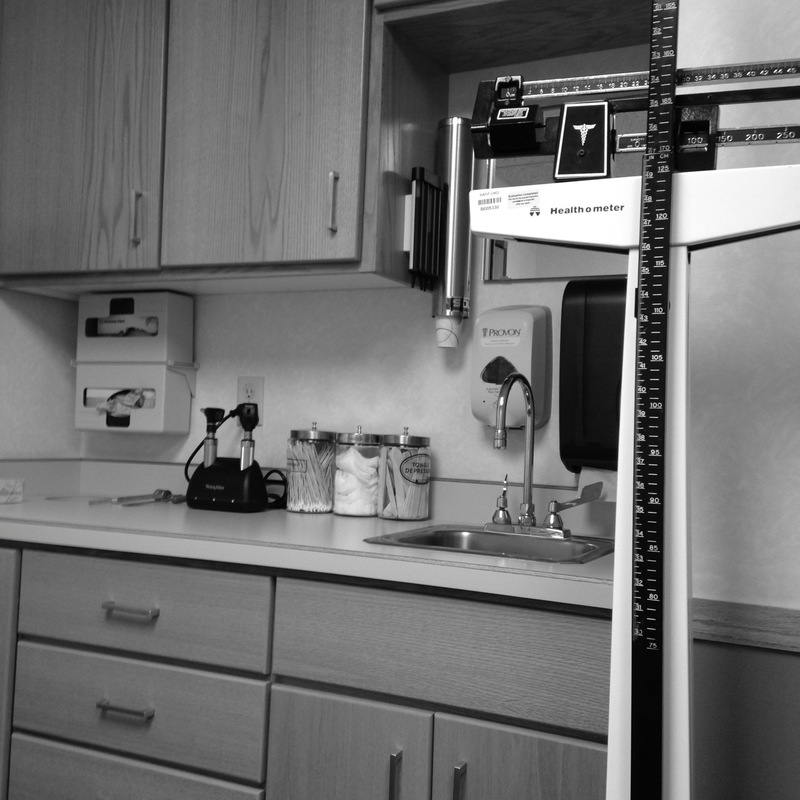 And yes, I talked to the doctor about running. He knows I have a race coming up in less than two weeks. And yes, he said I could, as long as my breathing was under control. He said to listen to my body, which is what I will do. I told him I had two more races the first two weeks of March. He was genuinely happy for me and wished me luck. He DID NOT tell me to stop running. I just have to use my daily inhaler (the Pulmicort) and make sure to ALWAYS have my fast-acting inhaler (Ventolin) with me when I run. I can handle that. I know I won’t be breaking any speed limits when I run and I know there may be times I have to walk, but I am okay with that. I just want to run. Period. And that’s what I intend to do. I also know that when the temperatures warm up, I won’t have as many issues. It’s definitely the cold, damp weather that gets me. So with that in mind, I am really kind of torqued at Mr. Groundhog today. Apparently, there’s six more weeks of winter! YUCK! But at least I am ready if my asthma strikes hard again. I’ve been having a hard time with my asthma lately….so happy you went for help! I take the steroid inhaler daily now…especially with winter and wood stove. I’m actually seeing my asthma & allergy specialist tomorrow! Glad you were able to get your breathing under control. We used to have a nebulizer for Michael, but thankfully he grew out of it. Dean’s brother has severe asthma, and the last couple of winters have been tough. Well Celeste, I’m so sorry to hear about this. I have had that awful stuff for at least 12 years, and I can identify with all of this. 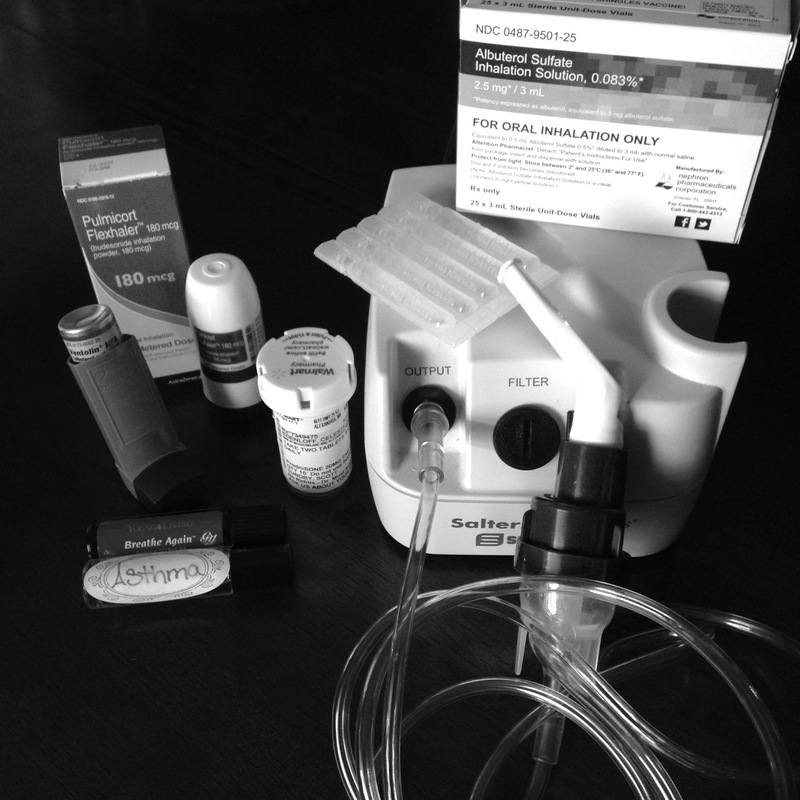 Just bought a nebulizer this winter on my ENT drs advise. I do remember how the cold weather would affect me. After shoveling snow or just walking fast in the cold air made it worse. This is nothing to fool around with, I’m sure from your research you know how dangerous it can be. I know you are a runner, but please listen to your body. Don’t want to read about any more episodes. Take care, honey, sping will EVENTUALLY come. Gosh, I hope the Pulmicort works. I don’t think you should need the rescue inhaler that frequently! I was diagnosed with asthma 10 years ago, but it only bothers me now in races or cold weather. I had a few very scary asthma attacks when I was first diagnosed, and understood for the first time how serious it is. Apart from the worst episodes I mostly had a nagging a cough which the pulmonologist had to explain was the asthma — I had no idea that was a symtom. Next Next post: A major a-ha moment!